In 2017, according to the National Safety Council there were over 40,000 deaths in the United States related to reckless driving. The top three causes of these deaths were alcohol, speeding and distracted driving. In 2016, every single day someone in Texas was killed in a car accident with 3,776 deaths that year and of those 3,776 deaths, 1,722 deaths were attributed to alcohol impairment. In 2016, Texas had 265,076 car accidents resulting in personal injuries. In 2016, West Virginia had 269 deaths that were caused by car accidents and of those 269 deaths, 145 deaths were attributed to alcohol impairment. If a driver driving recklessly causes a car accident by disregard to follow the rules of the road and injures or kills you or any of your family members, it may be necessary for you to file a personal injury civil lawsuit to recover money damages if you are injured. If a family member was killed in an accident it may be necessary for you to file a wrongful death civil lawsuit to recover money damages for their deaths. When reckless driving, aggressive driving or road rage causes injury or death, victims may be entitled to recover compensation for their losses. This may include compensation for medical bills, lost wages, emotional distress, pain and suffering, disfigurement, loss of consortium or wrongful death. An experienced car accident attorney at the Underwood Law Office can help victims of reckless driving accidents take legal action and recover the maximum amount of money they deserve under the law. Take the time out of haggling with insurance companies who have only their best interest in mind. Hire an attorney used to dealing with insurance companies, with your best interest in mind. The Underwood Law Office is experienced in handling all types of personal injury and wrongful death lawsuits against reckless drivers and their insurance companies. What is Reckless or Aggressive Driving? Reckless or aggressive driving refers to driving in a way that puts people at serious risk. Reckless driving goes beyond just exceeding the speed limit by a mile or two an hour or coming to a rolling stop at a stop sign. Reckless driving or aggressive driving refers to inherently dangerous behaviors that endanger not just the reckless driver but also everyone else on the road. Many times, individuals driving in this manner are charged with reckless driving, a traffic violation, by a police officer, which is a moving violation, that may include fines, or jail time. Often, such violations violate state laws governing how fast you can drive on the highway. There are consequences to careless driving other than those involving the courts. Such consequences for wanton disregard for the posted speed limit include increases in insurance premiums and driver’s license suspension. Ignoring yield signs or failing to yield to other drivers or pedestrians with the right-of-way. Ignoring traffic signals, including red lights and stop signs. Driving too closely behind the vehicle in front (tailgating). Passing in no passing zones, passing without sufficient space or passing in an unsafe way, such as speeding on the inside lane of a highway. Weaving in and out of traffic, especially on highways. These behaviors are considered extremely dangerous because they significantly increase the chances of a car accident happening. The Governors Highway Safety Association also includes speeding in its definition of aggressive driving. Speeding-related car accidents resulted in 4.57 million injuries and caused $413.8 billion in financial losses and over 40,100 deaths in 2017 according to the National Safety Council. Aggressive or reckless driving is illegal for a very good reason: many people lose their lives each year because of bad decisions made by reckless drivers. The AAA Foundation for Traffic Safetyindicates that as much as 56 percent of all fatal U.S. car accidents result directly from aggressive driving. With around 40,000 people killed in car accidents each year in the United States, this means that many people are dying from preventable car accidents that could have been avoided if drivers simply had made the choice to be careful instead of driving reckless and aggressive behind the wheel. Unfortunately, people in a hurry, who are experiencing road rage or who are simply bad drivers still make the risky choice to drive in an aggressive way. These drivers not only increase the likelihood that an accident will occur, but they also increase the chances that a crash will cause serious injuries. The crashes often occur at higher speeds. This means a greater impact, more force and more serious injuries. The crashes are often head-on or side-impact. Both head-on and side-impact crashes commonly result from unsafe passing or failure to yield. Head-on crashes are especially deadly because of the combined force of the vehicles and the direct impact to drivers and passengers, while side-impact crashes are deadly because the side of the vehicle provides little protection from the force of a crash. Accident Lawyer Helping Victims of Aggressive Driving? If you were involved in a car accident caused by an aggressive or reckless driver, you may be entitled to compensation for your injuries and other losses. Family members of those who were killed in reckless driving crashes may also have a legal cause of action against the reckless driver. 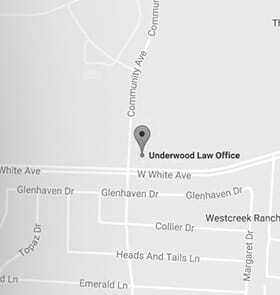 The experienced, caring car accident attorneys at the Underwood Law Office are prepared to help you with a settlement, lawsuit or any type of car accident claim arising from aggressive or dangerous driving. We know how devastating it can be when someone gets hurt because another driver chose to be reckless or aggressive. We also understand how important it is to you to get the full compensation you deserve and that you must move forward with your life. Our McKinney, Texas law firm serves all of Dallas and Fort Worth, including Plano, Frisco, Allen and McKinney. Our Huntington, West Virginia law firm serves all of West Virginia.